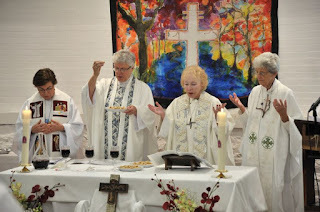 RORATE CÆLI: Op-Ed - Anglican Nightmare in Rome: "Ordained" Female Deacons, First Step Towards "Women Priests"
Op-Ed - Anglican Nightmare in Rome: "Ordained" Female Deacons, First Step Towards "Women Priests"
“Consecrated women already work so much with the poor and the marginalized: teaching the catechism, accompanying the sick and the moribund, distributing communion, [and] in many countries conducting the common prayers in absence of priests and in those circumstances pronouncing the homily. In the church there is the office of the permanent diaconate, but it is open only to married and non-married men. What impedes the church from including women among permanent deacons, just as it happened in the early church? Why not construct an official commission that might study the question?" The above quote was one of the questions asked of Pope Francis at the meeting of the International Union of Superior General of Women’s Orders in the Church in May 2016. The Pope’s response included a statement of his personal interest in the question and he promised to set up a Commission to investigate the question. Four members of the Commission were part of a panel discussion on “The Future of Women Deacons: Views from the Papal Commission and the American Pews” at Fordham University’s Center for Religion and Culture”. Panelists included 4 members of the Commission: Phyllis Zagano, a long time advocate for ordaining women to the diaconate, Jesuit Father Bernard Pottier, and Sister Donna Ciangio, O.P., the chancellor of the Archdiocese of Newark and principal and founder of Church Leadership Consultation. The moderator of the discussion was Father Thomas Rosica, CEO of Salt and Light. Fr Rosica is the priest who in a fit of enthusiasm for the pontificate of Pope Francis declared: “Pope Francis breaks Catholic traditions whenever he wants because he is “free from disordered attachments” Our Church has indeed entered a new phase: with the advent of this first Jesuit pope, it is openly ruled by an individual rather than by the authority of Scripture alone or even its own dictates of tradition plus Scripture.”. That quote sets the mise en scene of this panel discussion. Sister Donna Ciangio said that as a member of the Dominicans, the Order of Preachers, women have historically said that “we preach in different ways…That doesn’t satisfy me anymore.” Sister Donna’s dissatisfaction would seem to indicate that her own conclusion is the same as that of Professor Zagano. Fr. Pottier seemed, on the basis of the report, to agree that there is no valid objection to the ordination of women deacons. We cannot judge the content of the Commission’s work delivered to Pope Francis until that is published in its entirety, which, given the present way of doing things in Rome, may not ever happen. Perhaps Pope Francis will read it and decide that women should be ordained deacons without ever telling the Church what the basis of his decision is. It reminds one of the Consilium set up after the Second Vatican Council that was entrusted to carry out the wishes of the Council on the renewal of the Liturgy. One should never entrust a reform of something that those entrusted with the reform despise. But we can make a few observations based on what the members of the Commission have said at the Forum at Fordham. The panelists made no mention of the publication of the International Theological Commission in 2002 on precisely the question of the diaconate in the history of the Church vis a vis its sacramentality. This question is complex and the ITC is careful to give the history of the diaconate as best they can given the historical record, which is incomplete and often contradictory. This study was done mainly in relationship to the “renewal” of the Permanent Diaconate after Vatican II. But at the very end of their report the ITC briefly addresses the question of women deacons. This certainly is not a ringing affirmation of ordaining women to the diaconate. The careful work done by the ITC shows the complexity of the question and in no way supports the idea that women were ordained to the diaconate “for twelve hundred years”. We also hope that there will be a discussion of how the Permanent Diaconate has been received by the Church since Vatican II. One of the main reasons given for the “renewal” of the Permanent Diaconate was that they would be of great service in Missionary situations like in Africa. What happened—and this is telling in many ways—that the great majority of Permanent Deacons are in the affluent West, and that about 60% of Permanent Deacons in the world are in the United States. One recent development that should be discussed and considered is why a number of dioceses in the United States are putting a hold on Permanent Deacons. There are dioceses in the United States that seem to be not positive about the Permanent Diaconate. The reason for this should be investigated and discussed. That there are negative feelings about the Permanent Diaconate among priests in the United States is an open secret. Why this is so should be openly discussed. If the Church decides—and at this time the Church seems to be the Pope—to ordain women to the diaconate it certainly should not be because they are women. There must be a reason to do so that is consonant with the Mission of the Church to the world: to proclaim Jesus Christ as Lord and Savior within the love of God who gave his only-begotten Son to die on the Cross that we might live, that Father who calls every man and woman to faith in His Son and to live that faith with love for all in this world. And this must be proclaimed within the Tradition of the Church, and consonant(pace Fr. Rosica) with the Vincentian Canon: Quod ubique, quod semper, quod ab omnibus creditum est” (That Faith which has been believed everywhere, always, by all). One last aside. At the Fordham Panel conference, someone in the audience pressed the panel to weigh in on women’s ordination to the priesthood. The panel thought this unhelpful to tie the question of women’s ordination to the priesthood with ordaining women as deacons. Pope Francis has said that the possibility of women’s ordination is a settled matter in the negative. As a former Episcopal priest( and at this writing, through the grace of God about to celebrate the 35th anniversary of my Catholic priesthood) who witnessed the collapse of any semblance of a Traditional understanding of the priesthood in the Episcopal Church on the basis of the “justice” of opening to the priesthood to women and doing so by a group of bishops in defiance of the teaching of the Episcopal Church on the male priesthood and the failure of the rest of the bishops to condemn this act—all of this gives me pause. And I hope I will be forgiven for not quite believing that in the minds of some Catholics, including prelates, women deacons are the first step to women priests. And that would be a deep and gross betrayal of Tradition and the Catholic understanding of the priesthood as alter Christus, where the maleness of Christus is objectively integral to who He is as the Savior of all women and men.